I'm doing easy today on my favorite blue cotton/bamboo blankie. TW bought it for Pop but before he had the chance to use it, I claimed it. I jumped on it and yelled "MINE!" He didn't have a chance. I would think that something with bamboo in it would be hard like wood, but this blankie is as soft as a baby's bee-hind. HAH! You might not know this but blue is my color. My Petfinder.com pictures were taken with a blue cloth as a backdrop. a painting on a wall, Woman! It looks like we're floating! Ack! That is gorgeous CK. TW will change her mind once she sees the $$ your art work brings in. You'll be famous! Oh, I forgot - you already are famous. CK, you are such a good painter. We are jut in awe of you. Glad you grabbed that blankie. Well done. Hope you have a great Sunday and your family too. I have a few books about cats who paint and I find that to be really fascinating! I've never met a cat who can paint until now! I love your artwork! CK, you make Picasso look like a novice!! Your SBB makes me wonder: Where is MY Soft Brown Blankie? Because, you know, I have not seen it in AGES. You know I almost never side with a Human against one of my Own, but honestly, I think you're being a little hard on the Woman. I actually believed you'd printed out your painting and hung it on the wall! So she 'shopped it pretty good. Oh! Your painting is Beauteous! Your Mommy should goes out and gets it printed on canvas and hand it on the wall. If yous keeps complaining maybe she will! Me loves your Easter Bunny header! It's BEAUTIFUL! The peep is just loving it... and so am I... of course! You're a real artist. Some gallery is gonna scoop you right up. You'll be famous! Yoo-hoo! Your artistic talent knows no bounds, CK! ...you should send me one of your works sometime. I'd love to have my assistant make you a present! Wow, your painting is so amazing! When they wrote that spoof book, Why Cats Paint, little did they know that one day, some would!!! Hi CK. You look very good with blue. It's truly your color. And I love your painting! Love all the color you put on canvas. Beautiful!! That is a great painting, CK! You are an amazing artist! 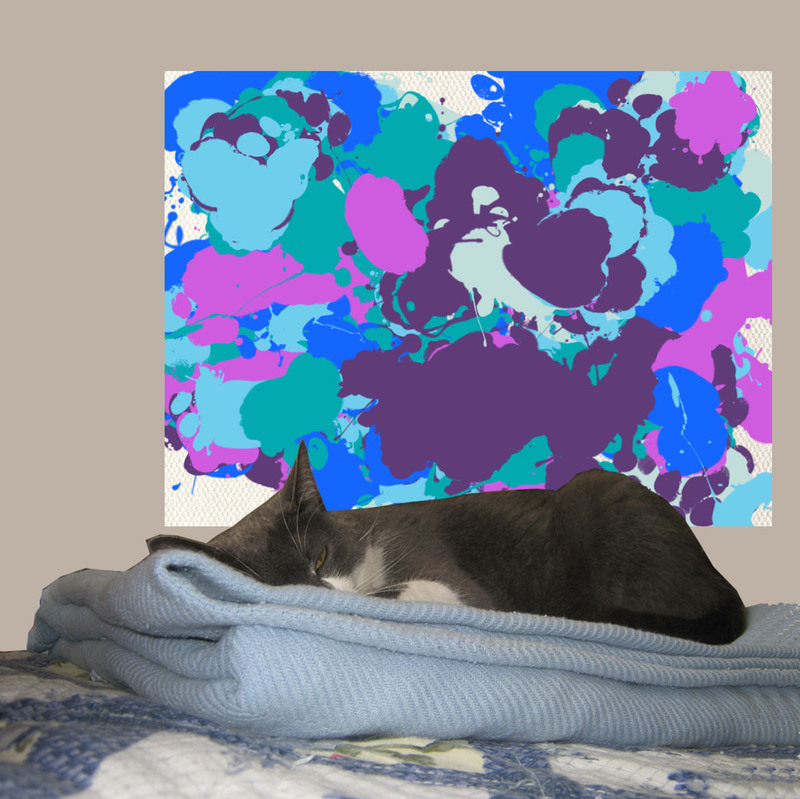 You should have a gallery showing, or at least sell your designs on Zazzle! You and your painting are both stunning CK! Well, we would pay a LOT of Temptations for a painting like that! P.S. Don't worry. The Human does a lot of peculiar things, but she would never chop off my tail, no matter how many shoes I yakked in. We are so impressed with your artistic talent, CK. Hard to believe you created that in only a minute!! it DOES look like a painting on a wall, what are you talking about!? Just don't go and cut off your ear! You did a great job CK on your latest, love the blues...you have real talent!